Breath of the Wild is not made for high-skilled players – What's in a Game? In the beginning, it seems like Zelda Breath of the Wild is refreshingly difficult. People find themselves dying more often than most games, especially other Zelda games. I recently posted an article on how BotW keeps a wide variety of players in flow and managing difficulty is a large part of that. One thing I thought I should touch on a bit more is how BotW forgets about high-skilled players in its game design. Using a survey I gave BotW players, I found heuristics to determine the amount of skill a player including the amount of time they played and how early they get the Master Sword. I found find that high-skilled players tend to enjoy the divine beasts quests less. I even found that the longer players play, the less they enjoy the game. This matches my anecdotal experiences of feeling that more high-skilled players will enjoy the game less. Let’s explore possible reasons for this. Let’s define high-skilled players. High-skilled players will go into any combat challenge and be able to achieve it with ease. How did they get this way? They may have come in with some natural skill from playing other games before. In general, they learned to be more skilled. They know the game’s systems so well that they can abuse these systems to trivialize combat. In a single playthrough, they’ve been playing a long time so they’ve made great progression – becoming stronger in-game. A lot of the enjoyment of the game comes from just exploring and finding new solutions in the game. It’s amazing to start the game and see all the new things it has to offer. I remember when I first found the enemy camp near the start of the game with enemies in the skull. I was amazed to realize that a clever way to defeat them was to shoot an arrow at a rope in the eye of a skull. There are countless experiences like this as you go through the game. With such a large world and variety of environments, the enjoyment of finding new things can last a while. Because there are so many choices players have to achieve their goals, it’s easy to come up with an optimal strategy. As my post on cooking and eating mentioned, while cooking has its advantages in the game design, a side effect is making the game too easy for high-skilled players. High-skilled players will take advantage of the cooking system to prepare for battles to make them even easier. Because they’re looking for an optimal strategy. While the durability system does a good job at balancing the game’s difficulty, it’s still not quite enough for high-skilled players. High-skilled players will tend to have better weapons at any given time than a less skilled player. They don’t need their good weapons for most encounters, so they can save them for the hardest. This makes them gradually keep getting and keeping strong weapons over time, meaning they will be able to use fairly strong weapons on everything. 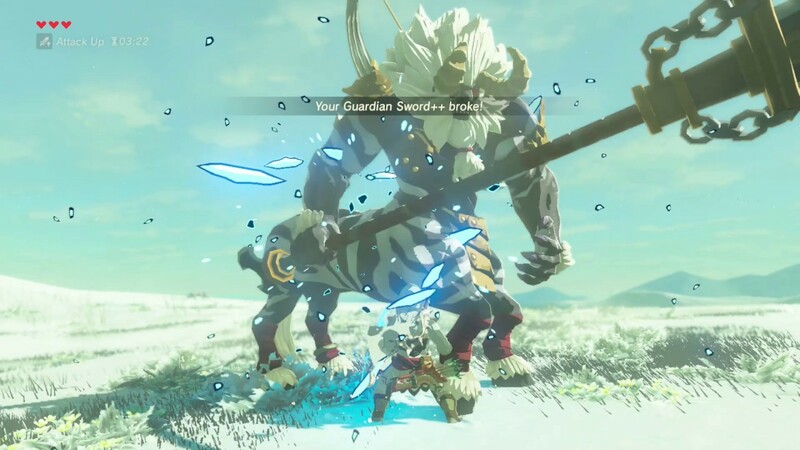 Even the silver Lynel is just going to be a minor set back in weapon and ingredient resources. The high-skilled players will quickly get enough resources back to be strong again in no time. Combining this with their natural skill in the game, it will make them even stronger then they need to be. Once you’ve achieved so much in the game, there aren’t many challenges left waiting for you. Perhaps this is a result of the game being too open-world. I think the developers may have been afraid of putting a nearly impossible optional boss anywhere in the world in case people would stumble upon it. They could’ve made a place that was really hard to reach and put an optional boss there. There’s already a large portion of the map that isn’t meant to be covered in the main story. It almost seems like a waste of space not to put more challenging things there. One explanation for this could be that Zelda has never been about being challenging, but I don’t think that is fair. This Zelda is already more challenging than most in the early-game. Additionally, this Zelda breaks many conventions of most of the series and seems to be going towards a more RPG approach than most before it. A common staple in RPGs since at least Final Fantasy V has been to include optional super bosses that are meant only for players who have defeated everything else. What can high-skilled players do to stay entertained? One major way players can stay entertained even after playing the game for several hours is to impose challenges on themselves. Since several forms of progression are largely optional, they can ignore these. Don’t upgrade your hearts – do a 3 heart run. Turn off the divine beast abilities. Try to beat the game without eating anything or limit what weapons you can use. Then, of course, there is the speed run. Can you beat the game in less than an hour? Some of these challenges can only be done by restarting the game. Some can be done during your current play through if you find the game too easy. Even if you’ve started getting hearts and want less of them, you can trade your hearts for stamina. This increases the risk of dying with the reward of getting more stamina. This might not be quite enough to make the game harder for high-skilled players, but it’s a start. There is DLC coming out later this year that promises to add more difficult content, but I can’t help but feel they should’ve included some of this difficult content in the main game. While Breath of the Wild is an amazing game for most players, it does have its shortcomings the more skilled you get. The lack of extra challenges along with easy optimal strategies for combat that does exist can leave high-skilled players disappointed and hoping DLC will provide them with what they crave. Even if high-skilled players find the combat to be boring, there’s still plenty of exploration and surprises waiting for them. As time goes on, there will be less and less to surprise these players and they will be ready to restart the game for a personal challenge or leave the game behind. If for some reason you haven’t played BotW, don’t let any of this stop you, buy it now. The game has plenty of excitement to keep players enjoying it well past 50 hours.